To add an Integration, you must be an Owner or Manager on the Project. For information on assigning roles, see the Members & Groups section of Managing your Organization. Webhooks: A user-defined callback that allows Unity to send POST requests to an external service. Discord: Send notifications to your team’s Discord channel through a Discord-defined webhook. Slack: Send notifications to your team’s Slack channel through a Slack-defined webhook. Email: Send notifications to your team by Email. JIRA: Create or update JIRA tickets using a JIRA-defined webhook. Unity Personal limits users to one Integration for all events, but multiple Unity services can use that Integration. Unity Teams, Plus, and Pro users can have up to 100 Integrations. 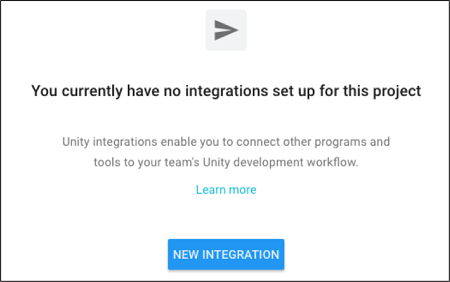 If your Unity Teams, Pro, or Plus subscription expires, Unity keeps all of your current Integrations, but automatically disables them. If this happens, you can still sign into the Unity Services Dashboard and enable a single Integration. 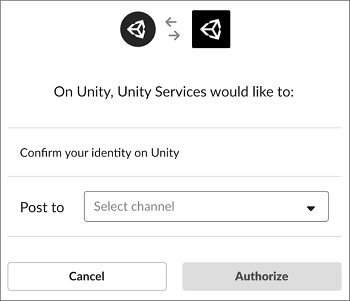 Sign in to the Unity Services Dashboard. Select the Project that you want to add an Integration to. In the left navigation bar, select Settings > Integrations. The integrations dashboard appears. Click the NEW INTEGRATION button. Select the Integration you want to enable. 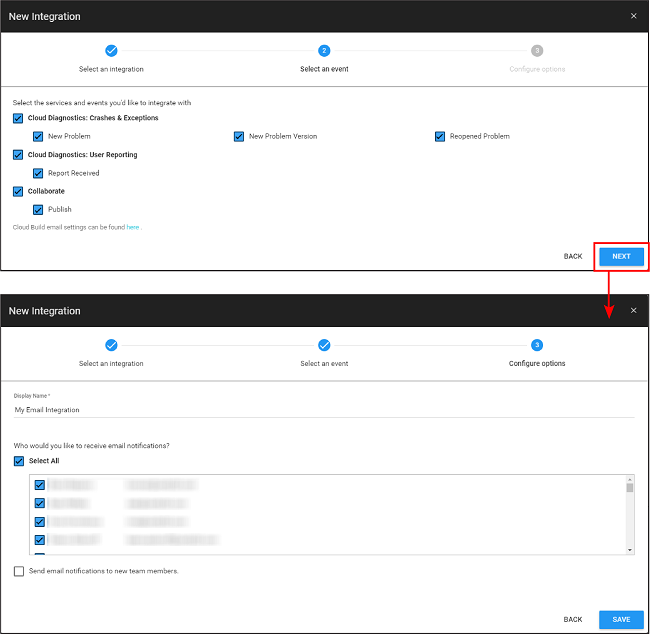 Select the event(s) that you want to trigger the Integration, then click the NEXT button. Configure the Integration options. These options vary depending on the Integration selected, and are described in detail in the sections below. Configuring a new tool to Integrate. Display Name A name to identify the Integration in the Integrations list. Disable SSL/TLS Verification Tick this checkbox to disable verification of SSL/TLS security certificates. Verifying SSL/TLS certificates helps ensure that your data is sent securely to the above Webhook URL. Turning this option on is not recommended, so only do this if you absolutely know what you’re doing. 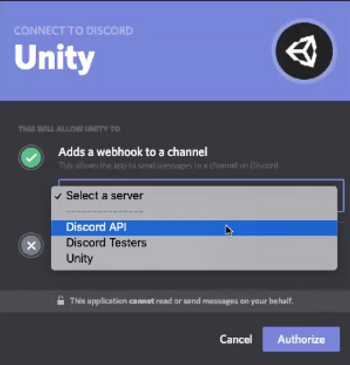 To configure Discord Integrations, Unity calls an app that uses the Discord API to register a webhook to a Discord channel. If you do not have a Discord server, see How do I create a server? in the Discord documentation. Important: You must enable webhooks on the account with which you are integrating. Create a new Discord integration and select its events. Click the NEXT button. Sign in on the Discord login screen. The CONNECT TO DISCORD dialog screen appears. From the Select a server drop-down menu, select your Discord server. From the Select a channel menu, select a channel to post notifications to. To configure Slack Integrations, Unity calls an app that uses the Slack API to register a webhook to a Slack channel. After creating a new Slack integration and configuring the events that you want to appear, you must authorize Unity to access your Slack server. Authorizing Unity to connect to your Slack server. If you do not have a Slack server, see Create a Slack workspace in the Slack documentation. From the Post to drop-down menu, select the Slack channel to post notifications to. Email Integrations notify team members when specified events for your Project occur. Create an email integration from the dashboard to view the events menu. Select the events for which you want to receive email notifications, then click the NEXT button. Note: Cloud Build handles email notification settings separately. You can configure them by clicking the here link at the bottom of the events menu. Select the team members for whom you’d like notifications to be sent. Select Send email to new team members if you’d like team members that you add in the future to automatically receive the emails that other team members receive. Cloud Diagnostics: Create a new issue when you receive a report. Unity creates the issue with one of the following labels: unity-user-report, unity-crash-report, or unity-exception-report. You must have permission to create an issue and modify the label column for these Integrations to work. Collaborate: Add a comment to an existing issue when you publish a change in Collaborate. JIRA Site URL The URL of your JIRA instance. 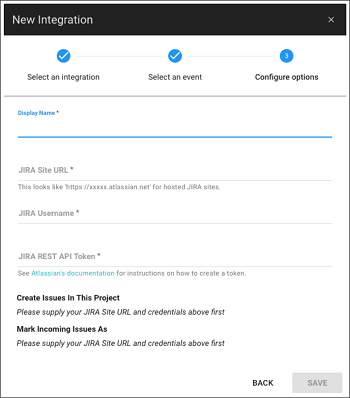 JIRA REST API Token The API token to authenticate Integration requests to your JIRA server. For instructions on how to create a token, see Atlassian’s documentation. Create Issues In This Project Select the project in which to create the issues. When you make changes in Collaborate, update JIRA-associated issues by referencing the issue key in your commit message. For example, “I fixed the crashes caused by ISS–42” adds publish details to issue “ISS–42”. Select the Project with the Integration you want to edit. In the left navigation column, select Settings > Integrations. For Slack and Discord Integrations, you can update the display name or delete the Integration. 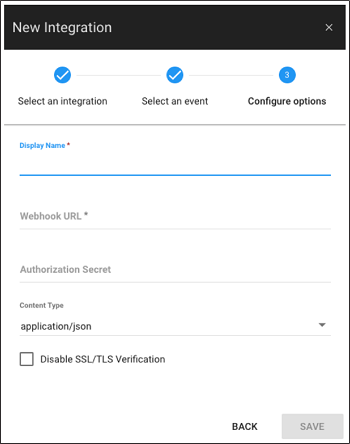 For webhook and JIRA Integrations, you can modify any of the configuration parameters that you supplied when you created them. To enable or disable an existing Integration, click the Status toggle to enable or disable the Integration. Managing Integrations in the Developer Dashboard.